The following is a list of highway work that may affect traffic in the Staunton District during the coming weeks. The following work is scheduled, weather permitting, on the Route 29 corridor in Albemarle County and the city of Charlottesville. Single lane closures will occur on Interstate 81 northbound for bridge work located at mile marker 247.5 in the Harrisonburg area. The following highway work is scheduled, weather permitting, in the Culpeper District during the upcoming week. Several Interstate 81 paving projects in the northern Shenandoah Valley will have weekend nighttime work July 7 – 9. Governor Terry McAuliffe today announced the opening of the last two Route 29 Solutions design-build projects. Three lanes are open in each direction on Route 29 between Polo Grounds Road and Towncenter Drive in Albemarle County. 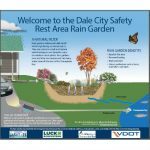 VDOT and the Alliance for the Chesapeake Bay partnered to install a rain garden at the Dale City Rest Area on Interstate 95 south. The northbound Interstate 81 off-ramp at exit 251 in Rockingham County is scheduled to close for about five hours beginning at midnight tonight. An additional night of ramp closures has been scheduled for southbound Interstate 81 exit 247 (Route 33/Harrisonburg) in Rockingham County. A portion of Route 620 (Newport Road) in southern Augusta County is scheduled to close at 8 a.m. on Wednesday, July 5. When it comes to holiday travel, VDOT believes it’s not where you’re going but how you get there that counts. Interstate 81 will have some lane and ramp closures between June 25-28 in Rockingham and Frederick counties. Highway work in the Lynchburg District requiring road/lane/structure closures is scheduled, weather permitting. All sinkhole work is complete on Interstate 81 southbound in Augusta County. Paving operations on Interstate 81 northbound in Rockbridge County require overnight lane closures beginning Sunday, June 25. An additional night of ramp closures has been scheduled for northbound Interstate 81 exit 307 in Frederick County. Alternating lane closures are scheduled during overnight hours next week on Interstate 81 northbound and southbound in Frederick County. Two cross streets within the Route 29 Widening project will be closed on successive nights. Overnight lane closures are scheduled for next week at several locations on Interstate 81 in Augusta County. VDOT recently won the Richmond Technology Council award for Innovation in Development – Public Sector. VDOT is going to help make travel easier during the Memorial Day holiday by lifting lane closures where possible.